Ensuite Cabin 3 sleeps 5 people, has an double bed + 1 single bed, + 1 single bunk bed, ensuite shower & toilet. 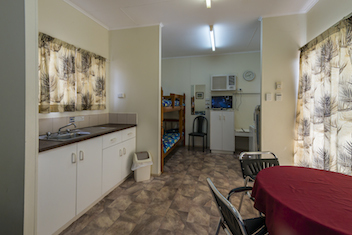 Air-conditioner, TV, Iron/ironing board, a kitchenette with cutlery, crockery, microwave oven, and a small fridge. One of the villas is designed with wheelchair access and disabled facilities in the bathroom. Villa 1 has a large handicapped bath room. Click here for details. What is in your Cabin?